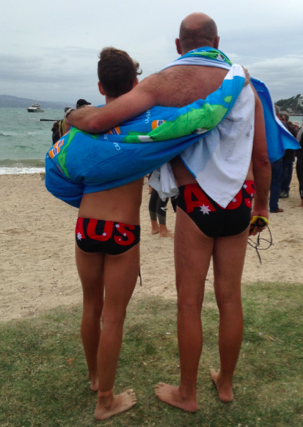 Father Martyn Southall and son Reece Southall are all set to go mano-a-mano against the best ocean swimmers in the Pacific Ocean at the annual Waikiki Roughwater Swim in Honolulu, Hawaii. 17-year-old surf lifesaving Reece is coached by Brendan Capell, the 2004 FINA 25 km world champion) and has won numerous events around the Pacific Rim from the 17.5 km Epic Swim in Lake Taupo, New Zealand and the 15 km Pacific Open Water Challenge in Samoa to the 3 km Bay Break in Australia and the 3-time Samoa Swim Series champion. The Brisbane duo are ready to sprint 3.8 km across Waikiki Bay, especially since the 50-year-old father recently finished his first 10 km event – The Jubilee River Swim. Wife and mother Jo Southall says with her son and husband in the event, "They have the field covered: One towards the front and one towards the back." For more information on the 48th annual Waikiki Roughwater Swim, visit here.